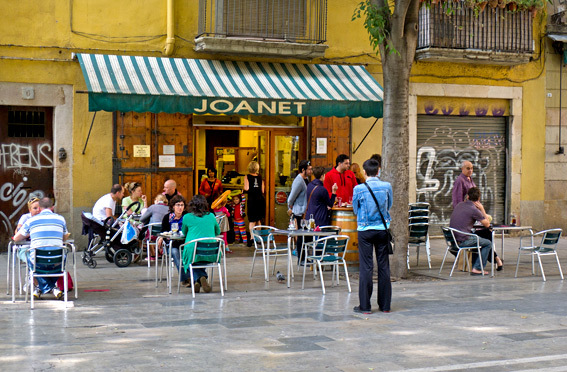 On Monday I had lunch in Joanet, a lovely little bar in El Born (an old part of Barcelona next to Barrio Gótico), near to Santa Maria del Mar church. The bar is in a small and fairly quiet plaça and does an excellent three course lunch menu for only €10,50, including wine. Interestingly the wine is served in a 500cl Grolsch bottle. For my first course I had a Tostada de Escalivada con Anchoas – this is a very Catalan dish, which is cooked over hot ashes or on a griddle. Sweet red peppers and aubergine are cooked until they blacken on the outside, then they are peeled and sliced. 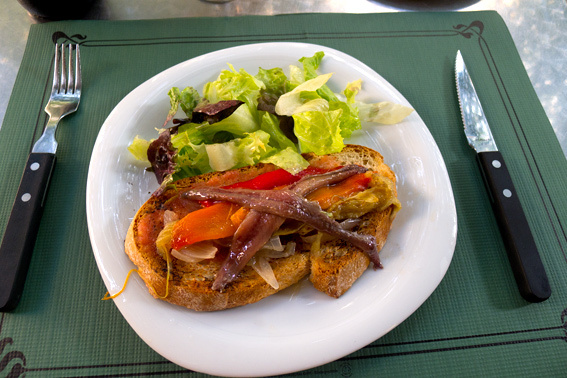 The vegetables are served on toasted bread (also done on the griddle), with anchovies and olive oil. Mine also came with some cooked, sliced onion and a salad on the side. My second course was Tempura de Pescado con Veduras. 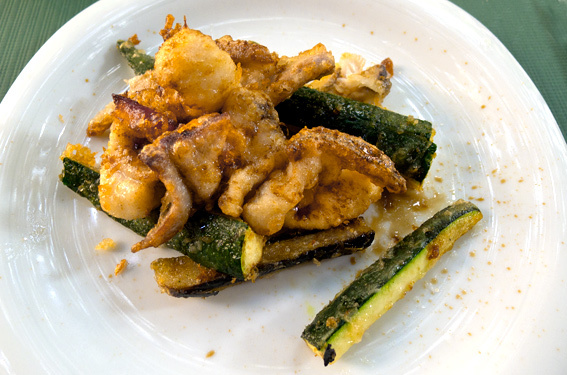 A fish tempura, containing calamari, prawns and cod, with sliced courgette. Most people associate tempura with Japanese cuisine, but in actual fact it was introduced to the Japanese by Spanish and Portuguese traders and missionaries, during the sixteenth century. 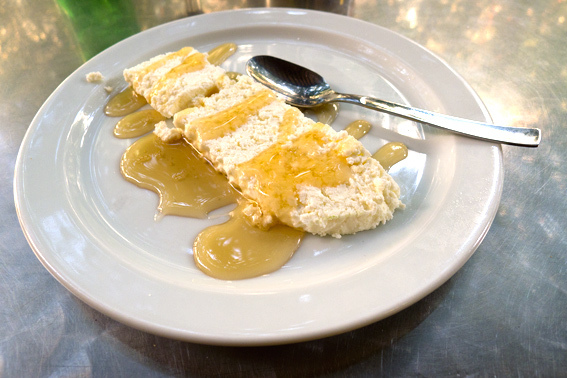 For pudding I had another very Catalan dish, Mel i Mato, a soft, fresh cheese served with honey. Joanet never disappoints – the food here is always delicious and very good value. It’s family owned and run – don’t come here at night, the owner says that working hard in the daytime is more than enough! I highly recommend their fish soup and Crema Catalana too – both are excellent. 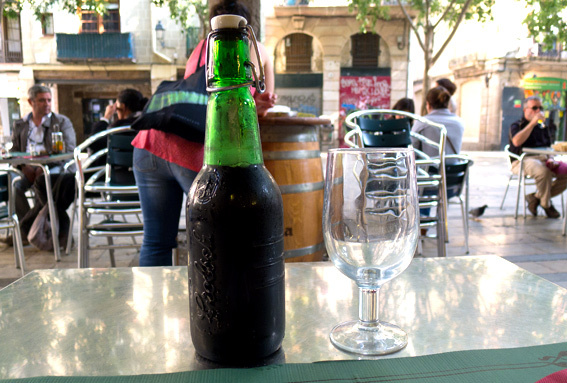 This entry was posted in Barcelona, Barcelona Bars and Restaurants, Drink, Eating Out, Fish, Food, Restaurants, Spanish and tagged anchovies, Catalan, cheese, Crema Catalana, Escalivada, honey, joanet, mel i mato, tempura, tostada. Bookmark the permalink. Hi MD! Great place, now I know where to eat when visiting BCN. Enjoy! Lovely menú – and I had never heard of mel i mato, sounds delicious.